Today I am happy to feature my husband, José, sharing his understanding of detachment. José is a reluctant writer – who has been co-erced by me to get back to writing! He writes at our shared blog From 7Eight on some of his other loves – food, travel and books! My initial reaction was to wonder whether I had made a mistake in signing up for this retreat. Because in my mind, not having an attachment, meant giving up or renouncing. Like a Buddhist monk, who has given up his worldly possessions and lives on ‘dana‘ or charity of others. Years later, I got interested in Vipassana meditation. And having joined up for a ten day course at Dhamma Giri at Igatpuri, I realised that the central purpose of the mediation was to overcome suffering by eradicating craving and aversion, i.e. the obverse of craving. Again detachment or no attachment. Only at Dhamma Giri, the rationale behind detachment is the fact that ‘nothing is permanent’ or annica. As such, any craving or aversion will invite suffering as the object of the craving or aversion is impermanent. Realising that nothing is permanent, the mediators were taught to observe their breathing and be aware of the sensations on the body, as techniques to eradicate craving and aversion. But the sum and substance was the same grace of detachment that I was first introduced to by Fr. Ribes. I believe that I have been singularly blessed to have been exposed to both Ignation Spirituality as also Vipassana meditation. Whilst the former taught me that detachment is a grace based on acceptance of God’s Grace, the latter helped me appreciate detachment at the individual level. At the end of the day, what I have come to realise is that being detached helps one navigate the shoals and uncertainties of daily living. By learning to accept that nothing is permanent and not everything can be controlled, I am accepting the world as it is and not as I wish it to be. I think that this dialogue from Volume 2 of The Prayer of the Frog by Anthony de Mello, S.J. best illustrates my understanding of the concept of detachment. I would end this post on a note of caution. I have often seen people become so detached that their behaviour can well be labeled as ‘criminal’ detachment. It manifests itself in various ways. Like someone who let the interior designer run amok in his new apartment, because having given the assignment he chose to remain aloof thinking he was detached. Or becoming fatalistic and accepting injustice in the name of detachment. Very well written article and I like the note you end it on. Too much detachment. I had a similar experience while learning Reiki. Will share it on my blog sometime. Thanks for the Gyan!! Too much detachment is more dangerous than having attachments, which is why I label such behavior as ‘criminal.’ Claiming to be detached is an easy way of escaping one’s responsibilities. Looking forward to your post on your experience whilst learning Reiki. wow!!!.. a thought provoking post.. and on my part I do have a long way to go …. I believe most of us have a long way to go. Being detached is not easy. I love the quote about things not owning you. It’s so true. I have learned to live with much less in order to stay home with my son. The time together is worth so much more than the things we could buy. Thanks for sharing. Its so easy to pontificate about being detached, yet so difficult to practice. It’s great to read that you are actually walking the path and enjoying it. This is so thought provoking! Just a day before yesterday, a friend was suggesting that we go for a 10 day Vipassana meditation course! Your post has given a lot of insights and has convinced me to explore and experience this too! “I cannot always get what I like, I have learnt always to like what I get. So I am quite sure we will have the kind of weather I like”…If one can follow this in life, things would so much easier and happier in our life! Thanks for sharing this wonderful post, Jose! Yes, Shilpa, if only we learn to like what we have or a given, we would be happy. But then, in today’s aspirational world, it is not easy to adhere to this way of living. And I do hope you follow through and attend the ten day course. Jaipur does have a great centre. the last few lines that Shepard says strikes home. To go on with life, it’s necessary to know when to draw the line. Ambition is good but not that price of peace. 🙂 Loved the insightful post. I fully endorse your sentiment that ‘ambition is good but not at the price of peace.’ Today in a ‘greed is good’ world, it is very difficult to live a life without attachment. I love this post…it does so much to teach me some. I am someone who needs to learn to detach myself. Thank, Jose! Thanks for your comment. I do hope that in time, you will learn to be detached. Not the easiest of things, but worth the effort, I guess. A world apart, but some themes transcend cultures and lifestyle barriers. Thank you for this post. Yes, worlds apart but then there are many roads to the same goal, viz. peace of mind. Nice to hear from Jose again. Your post was great to get me thinking. Detachment and acceptance can be a good way to handle that which we can’t control. I agree though that too much detachment and you are not really participating in your life fully and are more like an unemotional spectator watching life pass by. It’s a fine balance to realize what’s important to care about and what isn’t. Yes, one has to strike a fine balance in attempting to discern what is important and what isn’t. Actually, striking this balance is as difficult as not succumbing to cravings. This is a powerful post and I’ll be thinking about it for days. I believe I also misunderstood the concept of detachment. There’s been many times in my life when I have given away as many possessions as I could, fearing I was becoming too “attached.” Perhaps I need to rethink my approach. Not that I’ll ever be materialistic–it’s just not who I am–but I don’t have to give away everything I own, either. I wish I knew how to be precisely who God wants me to be. I wish the guidelines were more specific. The last line of your comment has me smiling. Yes, I do wish we had some tailor made instruction manual to assist us in navigating our lives. Unfortunately, there is no such manual and we have to use a trial and error method. I believe Thalib says it all. Detachment is very subjective feeling, Detachment towards materialistic things is good and feeling detached to your family and loved one’s is worst. I believe that you cannot remain detached only from material things. After all, nothing is permanent; even family and other loved ones. I am familiar with (and studied) Vipassana Mediation and currently practice the Examen! I agree the former is at the individual level and the latter, God’s goody grace! This was great Jose. Corinne was right to get you back to writing! The image at the outset is a wonderful play on words too! If you are familiar with the techniques taught in Vipassana Meditation and practice Examen, I guess you are streets ahead of the rest of us. And thanks for the nice things you have said about the post. Thanks for your comments. Learning to like what we have or receive is not as easy as it appears. It was such a profound one…..
Have a habit of holding on yo things.. Thanks for visiting. Yes, it is indeed difficult not to be attached. Thanks for visiting. Yes, I agree that mediation is very important for both our spiritual and mental health. Actually, the concept of detachment was the corner stone of the Ignatian Spirituality retreat. However, it was only after I attended my first Vipassana course that I appreciated the rationale of being detached, viz. anicca. A much needed calm and peaceful post on a Friday morning. Thank you Jose for that. It is easy and hard at the same time to be detached. Well, it seems so easy to understand the concept; putting it into practice is so, so difficult. Believe me. Thanks for your comments. Yes, we dc get attached to some things and this is the source of our ‘suffering’. You have written a very profound post. I cannot even begin to tell you how much of it I already follow and attempt to perfect. For that I need another post myself then 😀 What I found the best thing is the caution you have added, detachment has many ways not always the one which means give up life as such..
Richa, we are looking forward to a post sharing your journey. I am sure that it would be very edifying and thought provoking. Complete detachment is easier than the kind you talk of.. to own things but to not let them own you!! Very tough. Not owning stuff at all is way easier. Absolutely…we should learn detachment from around us….our childhood, young age, our life has no attachment with us; they leave us at a particular time, and we people always live with the fear of losing them. ..thoughtful post! Yes, we always live in mortal fear of losing something or someone, instead of learning to live in the present moment and enjoying what we have. Beautiful Corinne. Vipassana does get us detached frm all things just by watching them, lovely to hear of your experiences and understanding od detachment. I tell myself every now n then that I’m born alone n will go alone and the rest is a waking dream but still v real and v heartfelt.love. Thanks for your interesting comments. I found the the line ‘….the rest is a waking dream’ intriguing. Ali bin Abi Thalib has said it so well!! Very reflective post and so well told Jose. It will take a lot of will to practice this. Thank you for sharing your learning and understandings! Yes, Ali Bin Abi Thalib put it very succinctly. And yes, putting in into practice is not easy. Jose and Corinne, thanks for the wonderful post. You’ve explained it so beautifully. Alas, I have a long way to go.. I believe most of us are at the bottom of that steep hill on the road to detachment. We just have to keep striving, I guess. nothing is permanent and not everything can be controlled – my thoughts exactly. A very thought provoking post. Nice to meet a fellow traveler on the road to achieving detachment. Long and difficult road…. I’m not very possessive of things in general, and I do believe the reverse is true too. For the most part, nothing owns me. It is hard at times not to let that happen, but I’m glad that even if I am detached, I’m not too detached that things in my life run amok! Thought provoking post! And glad to have read it. Its nice to know that you are ahead of most of us on the road to achieving detachment. Not a very easy path to follow, but as you must have realised, it certainly has it benefits. Very interesting ideas, especially with the warnings at the end. Most thought provoking. Yes, the ‘statutory warning’ is very important. Otherwise, we will blame detachment for the woes and miseries in our lives. I too am participating in A to Z challenge and tagged your post in mine today.. Thanks, Hemant, for visiting and tagging the post. Yes, life would be so much simpler if we could be content with whatever we have. But I guess none of us are free of craving; otherwise, we would attain nirvana. Very profound post. I had to read it twice to get a clear understanding of the thoughts explained. I am glad to read such thoughtful posts through this challenge! I am glad that the post resonated with you. Hopefully, you find in useful. That quote said it all…your hubby is indeed wise. Thanks for visiting. Yes, the quote says it all…. It surely will take years before I get used to this whole concept! Getting rid of cravings is really a hard task! Yes indeed, getting rid of cravings is really a hard task. Mainly because, cravings or aversions are so insidious and difficult to distinguish from genuine needs. This was a wonderful post to read about an important aspect of any sincere spiritual quest. Thanks Jose and thanks Corinne for having him guest write this post! The first picture has been a delight ever since I first saw it on the net somewhere. It speaks so nicely of something so deep! The last word of caution in this post is also very appropriate, and very important to remember. Yes, it is so each to use detachment to escape the difficulties we face in life. Hence I thought that a word of caution was required. There is a reason I can relate to this post. My own guru specifies a wonderful tenet: Do every task with complete commitment and zero attachment. This means that we must do the task for the pleasure that it offers, not for the outcome that may emerge at the end of it. Wonderful to see someone echo that sentiment through this post, Jose. I particularly liked the ‘Prayer of the Frog’ extract. I guess there are many paths to the same well of wisdom. I believe that your Guru’s path is based on the Krishna’s instructions to Arjuna in the Bhagavat Gita. Jose, that ancedote on the person who was deatchaed enuf to let the interior designer run amok was indeed funny! It may appear funny and anecdotal, but we have actually visited that apartment in question. While I am exposed to these thoughts (from my schooling at Ramakrishna Mission Boarding Schools), really enjoyed reading it. I think I practice these to some extent and this was a good validation and reflection for myself. Thanks. I’m glad that you found the the post to be a good validation of your practice. It is indeed gratifying when someone who practices detachment, agrees with the thoughts conveyed in the post. Yes, Sulekha, the Bhagavad Gita too preaches about being fully involved in whatever we do, without a fixation about the outcome. 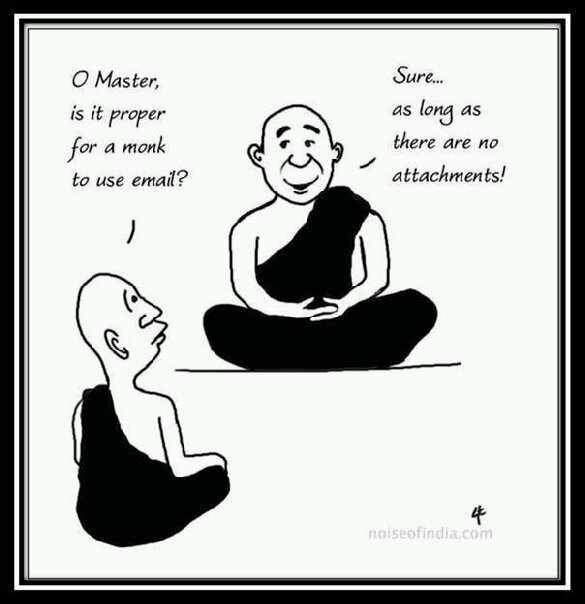 Another approach to renouncing attachments. I like the Danes attitude to the weather. I wish we can cultivate such an attitude towards other things too, whilst at the same time not using detachment to escape route. I loved the post and the quotes, Jose! Detachment of the kind you described is the path to true happiness. Gosh, I have a way to go. Sentimental attachment to things as I am learning is not good for health. These days, I ask myself, will this matter to me three months from now? And my answer surprises me sometimes. “It is Today” squeaked Piglet. What’s that about taking the first step…. The fact that you realise that you have a long way to go, implies progress. I like the question about whether something will matter after three months. And that quote from from Pooh; all about living in the present moment. Thought-provoking post! While I’m not a materialistic person, there are certain things of sentimental value that I am attached to. People who are constantly striving to obtain possessions are pretty shallow, in my opinion. It’s all superficial and in the grand scheme of life, what do they matter? I cannot but agree with the last line of your comment. In a line, it sums up what detachment is all about. Ever since I have heard about Vipassana, I have this deep desire to attend the course. Jose is lucky to have been to both Vipassana and Ignation Spirituality. Vipassana has to be experienced to be understood. Reading about or discussing the techniques does lead to detachment. Wow, the concept of detached attachment ! This post is very deep, and sets the train of thoughts in motion. It is very difficult to be detached, especially when the natural bond is very strong, but all wheels of spirituality speak of this detachment as a necessity for life. That we may own something, but that something may not own us ! Thanks for this thoughtful piece, Jose !! and Thanks, Corinne, for sharing this with us all !! Being detached is indeed a necessity for survival, on a day to day basis. 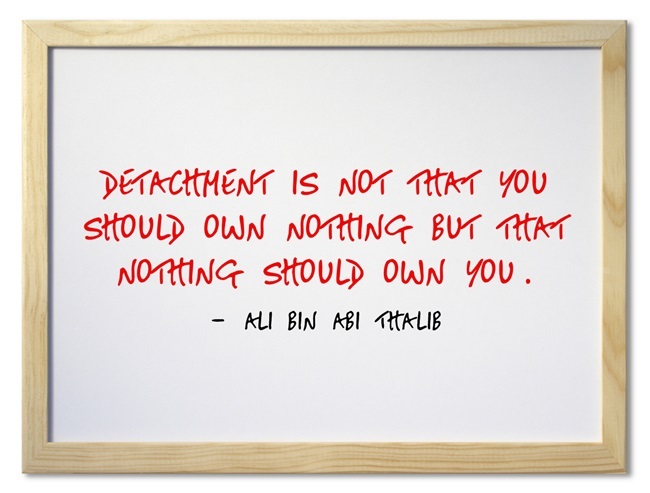 The bottom line is that ‘nothing should own you’, as Ali Bin Abi Thalib succinctly put it. Detachment is quite easy to spell, pronounce and write down, but not so easy to practise. Ali Bin Abi Thalib has defined it so well! And a topic for intellectual debate and to preach about. But so very difficult to practice, in daily life. I needed to read that today. Definitely a God thing! At one level, is certainly is a ‘God’ thing. But at another level, being detached is essential for survival of the individual. This is such a profound post… It got me thinking..But it’s so hard to be detached no? I find it really hard..at any point in time there are so many things that I want..
Detachment is not about wanting something that you require; the important thing is being able to to without it, in case you cannot have it.